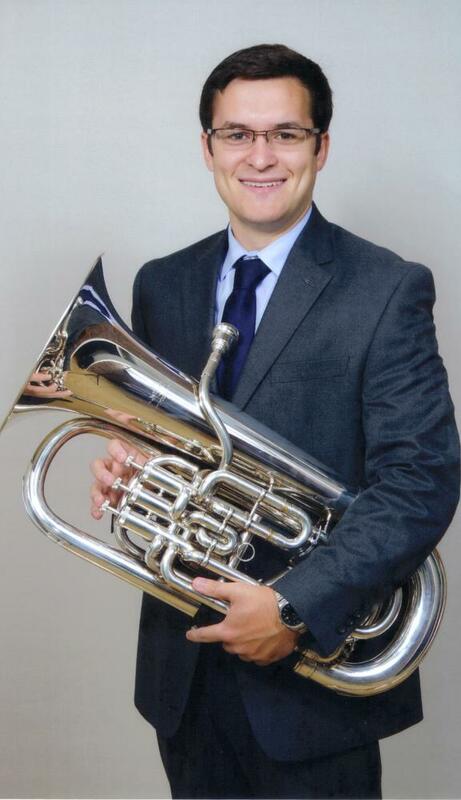 Congratulations to graduate student Stephen Cannistraci who won 1st prize in the euphonium solo competition (24 years old and younger) at the International Women's Brass Conference in June 2017, held at Rowan University (NJ). He went on to compete in the larger full brass competition, where he finished in 2nd place. Stephen has performed with the Penn State Symphonic Wind Ensemble, Valley Brass Band, Eastman Wind Ensemble, Eastman Wind Orchestra, Perseverance Band of Lebanon, and the Keystone Band of Rehrersburg. He was a winner of the Symphonic Wind Ensemble's Concerto Competition in 2016-17, performing Rolf Wilhelm's "Concertino for Euphonium and Concert Band" in April 2017. As a soloist, he has performed with the Perseverance and Keystone bands in community venues across central Pennsylvania. Also active as a chamber musician, he has performed with the Carillon Tuba Quartet, Nittany Tuba Quartet, and East End Brass – a traditional style German brass ensemble. Formed in 2012 at the Eastman School of Music, the Carillon Tuba Quartet enjoyed success performing throughout Rochester NY, as well as finishing 2nd in the 2016 International Tuba Euphonium Conference small ensemble competition. The quartet served as the Eastman School of Music’s Messinger Chamber Music Ambassadors for the 2015-2016 school year, conducting teaching and performing residencies in rural communities around Rochester. Performances outside of Rochester included a reception for University of Rochester donors held at the Essex House in Manhattan. The Carillon Quartet was awarded Eastman’s John Celentano Award for excellence in Chamber Music in 2016. Originally from Lebanon PA, Stephen is currently pursuing a masters degree at Penn State, studying with professor Velvet Brown. He holds undergraduate degrees in performance and instrumental music education from the Eastman School of Music, and was also awarded a Performer’s Certificate and Arts Leadership Certificate. He has performed in masterclasses given by Mark Jenkins, Bill Reichenbach, Toru Miura, and the Beaumont Brass Quintet. Primary teachers include Velvet Brown, Mark Kellogg, Larry Zalkind, Don Harry, Robert Rhine, and Wesley Nance.